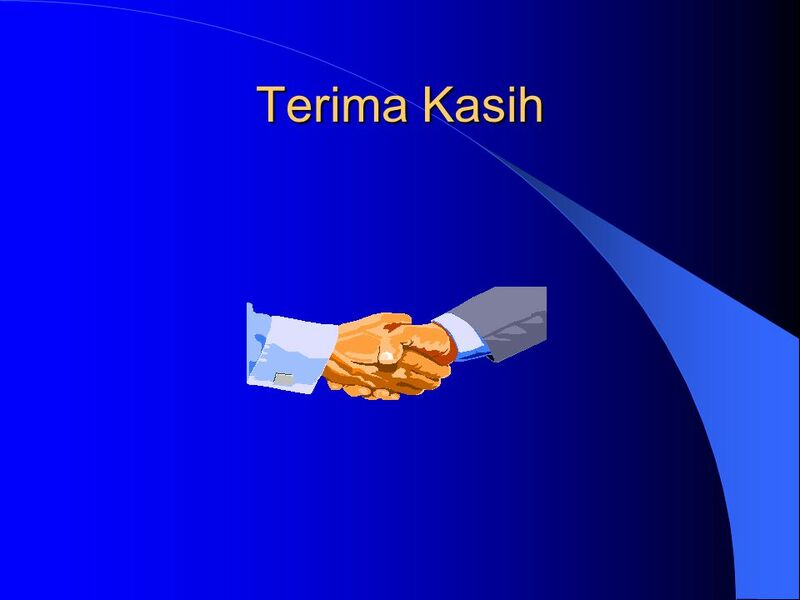 METODOLOGI SIX SIGMA PERTEMUAN 9 ( Perhitungan Statistik) OLEH: EMELIA SARI. 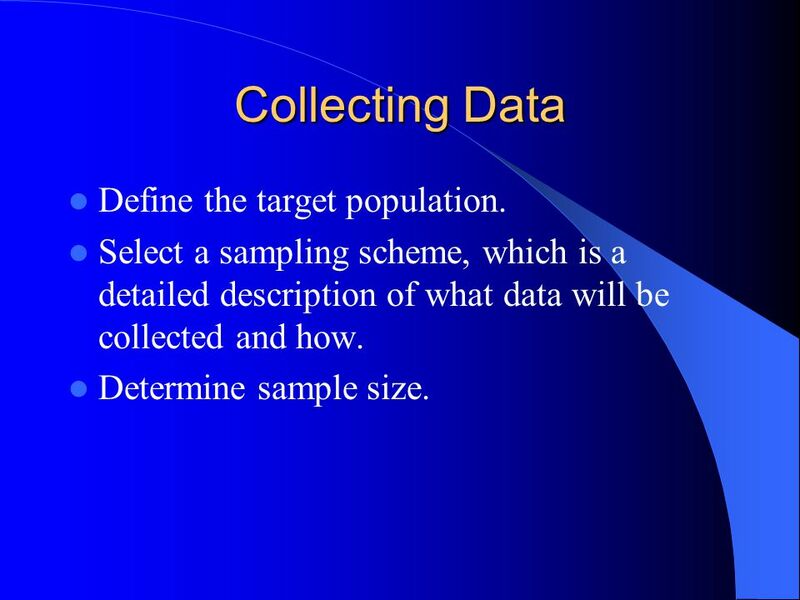 4 Collecting Data Define the target population. 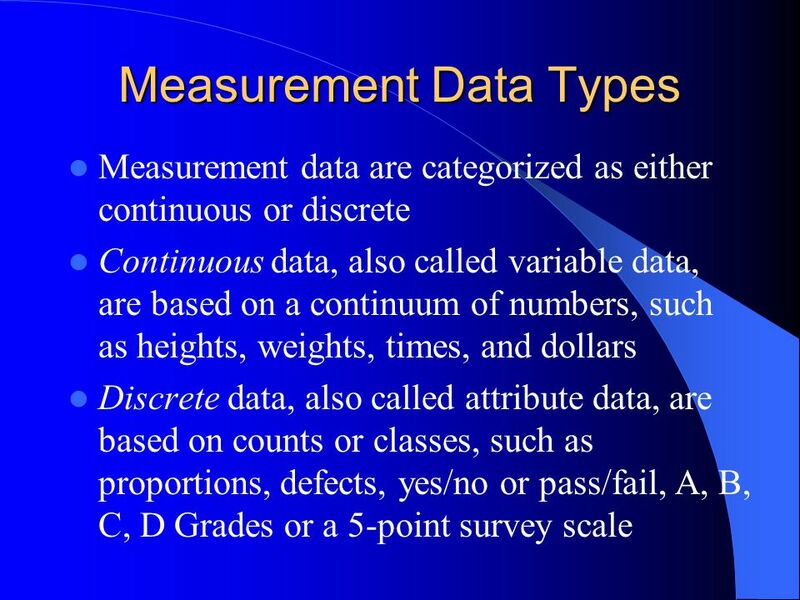 Select a sampling scheme, which is a detailed description of what data will be collected and how. 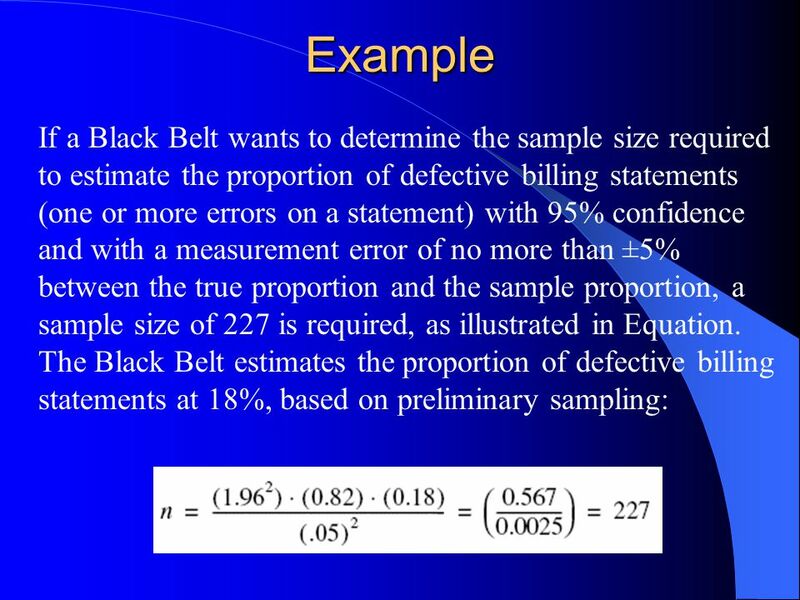 Determine sample size. 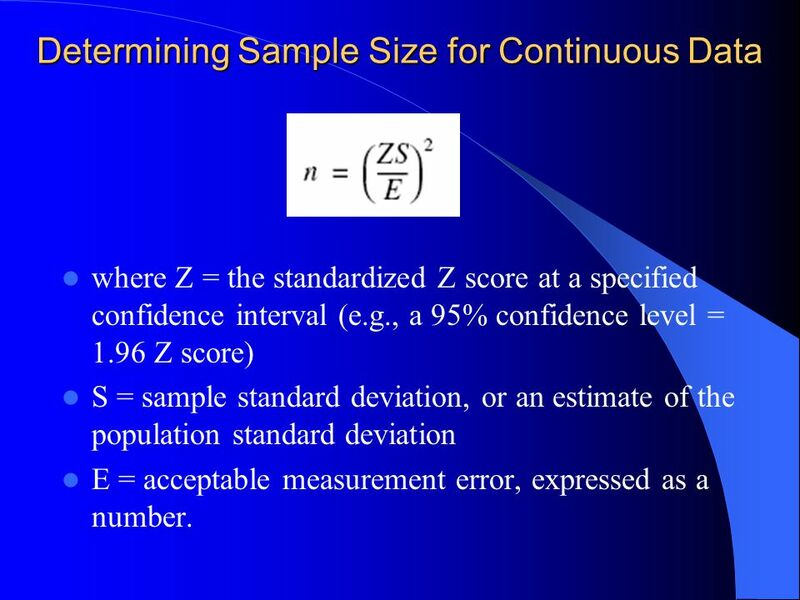 7 Determining Sample Size for Continuous Data where Z = the standardized Z score at a specified confidence interval (e.g., a 95% confidence level = 1.96 Z score) S = sample standard deviation, or an estimate of the population standard deviation E = acceptable measurement error, expressed as a number. 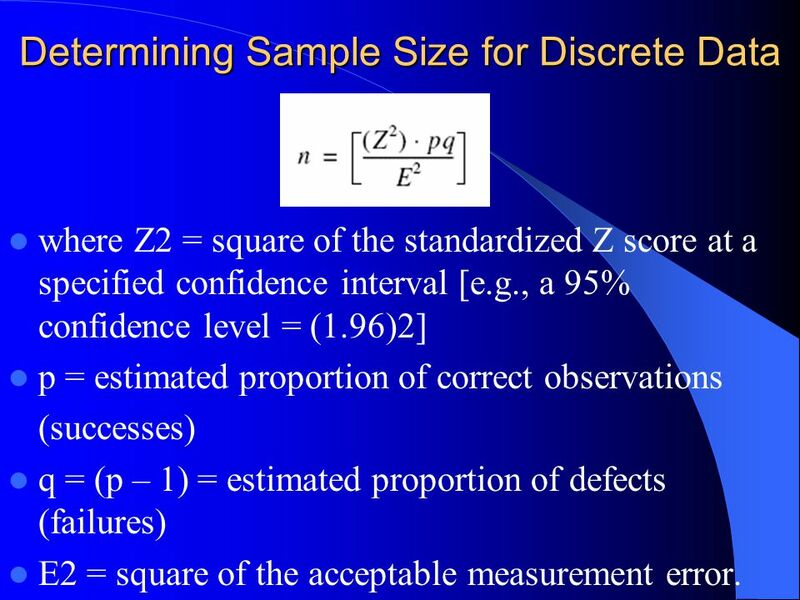 9 Determining Sample Size for Discrete Data where Z2 = square of the standardized Z score at a specified confidence interval [e.g., a 95% confidence level = (1.96)2] p = estimated proportion of correct observations (successes) q = (p – 1) = estimated proportion of defects (failures) E2 = square of the acceptable measurement error. 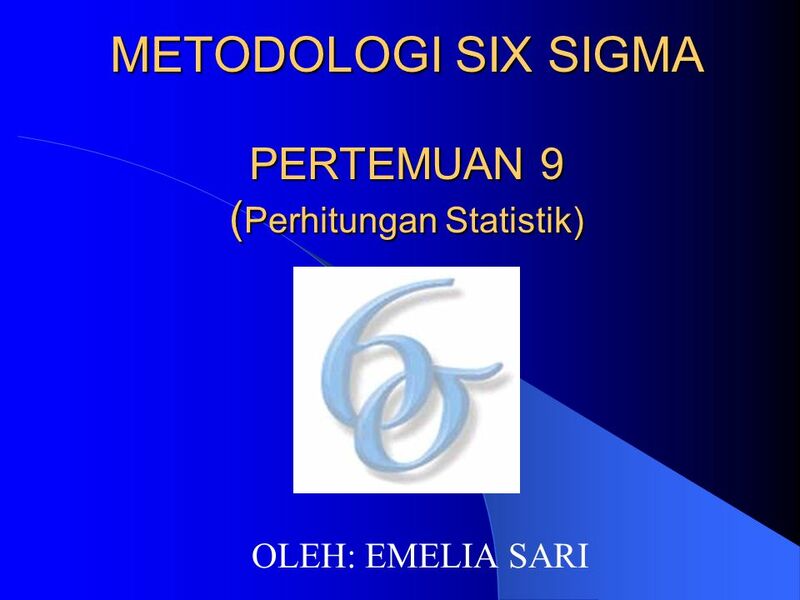 Download ppt "METODOLOGI SIX SIGMA PERTEMUAN 9 ( Perhitungan Statistik) OLEH: EMELIA SARI." Lecture (11,12) Parameter Estimation of PDF and Fitting a Distribution Function. 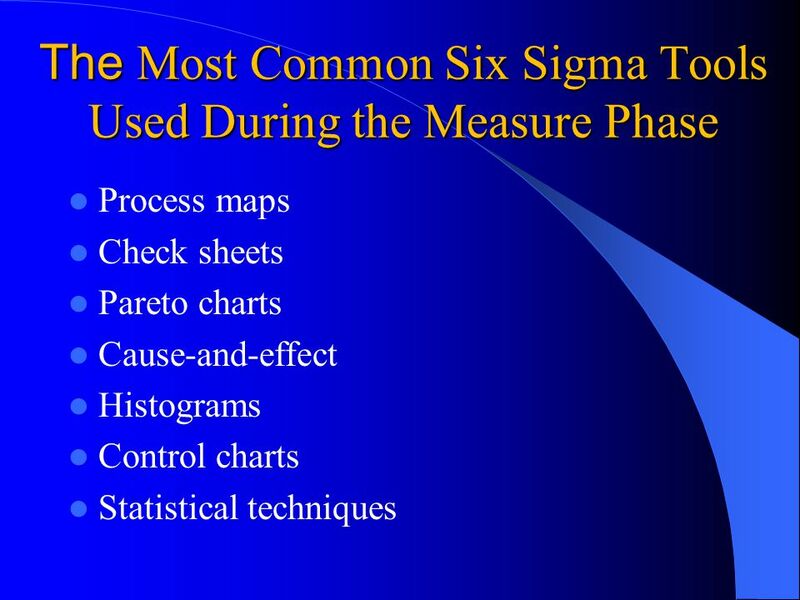 METODOLOGI SIX SIGMA PERTEMUAN 5 MEASURE PHASE OLEH: EMELIA SARI. Copyright (c) 2009 John Wiley & Sons, Inc.
1 Test a hypothesis about a mean Formulate hypothesis about mean, e.g., mean starting income for graduates from WSU is $25,000. Get random sample, say. Estimation and Testing for Population Proportions Introduction to Business Statistics, 5e Kvanli/Guynes/Pavur (c)2000 South-Western College Publishing. 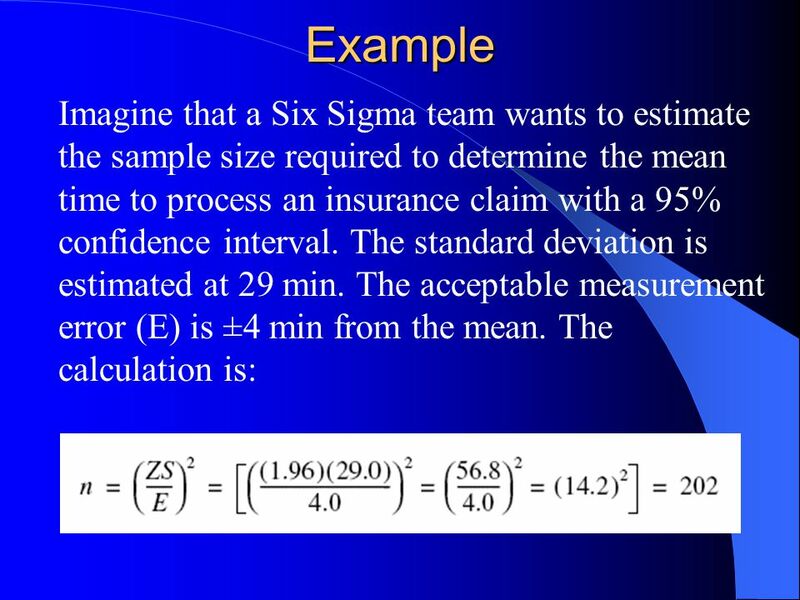 Typical Sample Sizes Incidence Rate Calculation. MIM 558 Comparative Operations Management Dr. Alan Raedels, C.P.M. Math 1040 Intro To Statistics Professor: Zeph Allen Smith Presented by: Nellie Sobhanian. Active Learning Lecture Slides For use with Classroom Response Systems Statistical Inference: Confidence Intervals. 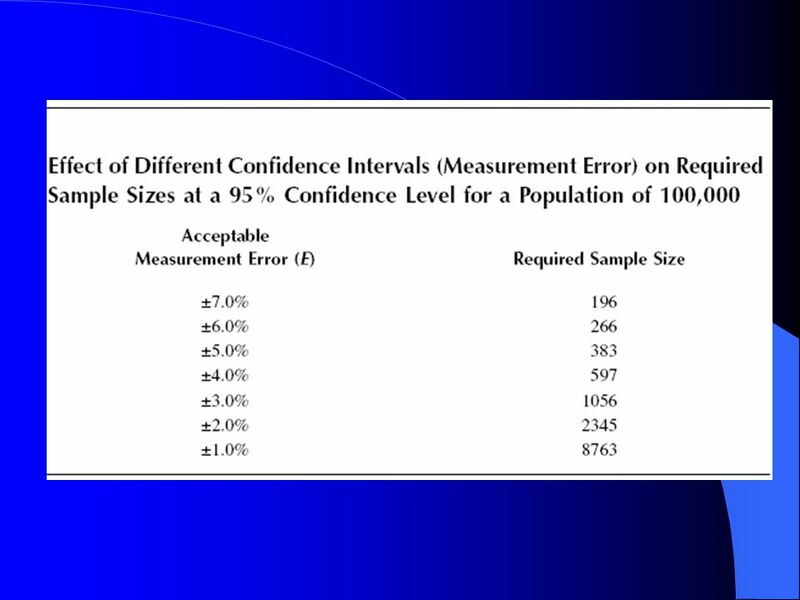 Business Research Methods William G. Zikmund Chapter 17: Determination of Sample Size. Population Proportion The fraction of values in a population which have a specific attribute p = Population proportion X = Number of items having the attribute. This work is licensed under a Creative Commons Attribution 3.0 Unported LicenseCreative Commons Attribution 3.0 Unported License (CC-BY). Project Management. Unit 7b Statistical Inference - 2 Hypothesis Testing Using Data to Make Decisions FPP Chapters 27, 27, possibly 27 &/or 29 Z-tests for means Z-tests.